The data was collected at a sequence of Synthesis retreats running between April and December 2018 as part of the Ceremony Study conducted by researchers at Imperial College London. The data we present in this report, relating to Synthesis participants, has been analyzed by our scientific team. The participants answered a variety of clinical study questionnaires at different points in the overall timeline of their experience, in order to create the full set of data that has been analyzed in our research. We collected data from the retreat participants at two further points, at two weeks and four weeks after psilocybin. The purpose of these periodic follow-ups was to find out about any changes in the individuals’ outlooks on life, in comparison to their scores before coming on the retreat. To measure this, we asked them to provide fresh answers to the same questionnaires that they had completed initially, two weeks before their trip. We used paired t-tests to map the differences between the timepoints. Given the preliminary nature of this study we elected not to apply a correction for multiple comparisons to avoid overly stringent control of Type II errors. The current analysis also does not control for repeated measures. Though promising, these initial results should be therefore interpreted with an awareness of the need for further scientific research. More research is needed, on a global scale, to further explore the wellbeing benefits offered by the psilocybin experience. However, these preliminary findings evidence the positive impact that Synthesis can provide, as well as the societal importance of further investigation into the therapeutic potential of psychedelics. We are delighted to have worked with the Imperial College Psychedelic Research Group to collect the data used to produce these results, and look forward to aiding future research with refined protocols at our retreats. According to their responses to the Warwick-Edinburgh Mental Wellbeing Scale (WEMWBS) 2, after going onto a Synthesis retreat, participants’ wellbeing scores were raised by 12.0% on average at two weeks after their psilocybin experience, and remained increased by 10.0% at four weeks. Normative population data indicates that Synthesis participants initially scored slightly below the national average (4.1%, 50.7 compared to 48.6), but their scores rose above it following the psilocybin ceremony and remained above it at the two (6.9%) and four (5.2%) week follow-ups, compared to the population baseline. Data was analyzed using a repeated measures ANOVA with a within-subjects factor of Time after the ceremony measuring subsequent effects of wellbeing at baseline, two weeks and four weeks. Mauchly’s test indicated that the assumption of sphericity had been violated (χ2(2) = 10.91, p = 0.004), therefore degrees of freedom were corrected using Greenhouse-Geisser estimates of sphericity (ε = 0.751). The main effect of Time was significant [F (1.50, 42.03) = 8.769, p = .002, η2 = 0.238] so post-hoc paired t-tests were used. Wellbeing was raised significantly [t(41) = 5.03, p = < 0.001] between baseline (M = 48.62, SD = 6.97) and two weeks later (M = 54.45, SD = 8.18). This difference remained significant at four weeks after psilocybin. [t(31) = 2.952, p = 0.005; M = 53.47, SD = 8.74]. According to their responses to the Quick Inventory of Depressive Symptomatology (QIDS), participants’ depressive symptoms were 44.2% lower than baseline level two weeks after psilocybin, and remained lowered by 42.4% compared to baseline four weeks after psilocybin. Data were analyzed using a repeated measures ANOVA with a within-subjects factor of Time after the ceremony measuring subsequent effects on depressive symptoms at baseline, two weeks and four weeks. Mauchly’s test indicated that the assumption of sphericity had not been violated (χ2(2) = 5.355, p = 0.069), therefore degrees of freedom did not need correction. The main effect of Time was significant [F (2, 56) = 8.343, p = .001, η2 = 0.230] so post-hoc paired t-tests were used. Symptoms of depression were lowered significantly [t(41) = -4.173, p = < 0.001] between baseline (M = 6.45, SD = 4.23) and two weeks after psilocybin (M = 3.6, SD = 3.04). This difference remained significant at the four week follow-up. [t(31) = -2.736, p = 0.01] (M = 3.78, SD = 3.79). The phenomenon that psilocybin, can function as a psychotherapeutic agent which can cure depression has recently become of its most widely-reported medicinal properties. Increasing numbers of studies from psychedelic research teams at top academic institutions worldwide have, collectively, built such a strong evidence base for the efficacy of psilocybin, the active component of magic mushrooms, as a remedy for treatment-resistant depression that the Food and Drug Administration (FDA) has granted psilocybin-assisted therapy a Breakthrough Therapy designation. This means that, rather than blocking the progress of further investigations, the FDA are likely to greenlight its development into an available treatment option, should the clinical trials that are currently underway in Europe and North America prove successful. Synthesis is proud to collaborate with Imperial College, London, in order to produce the data we collect on guests’ experiences at our retreats. Their Psychedelic Research Group is conducting pioneering research into psilocybin-assisted therapy as a treatment for depression. (See their paper on their 2017 brain-imaging pilot study on psilocybin for treatment-resistant depression, and their six-month follow-up study on psilocybin with psychological support, in which participants’ depressive symptom scores remained significantly reduced). In fact, the same Quick Inventory of Depressive Symptomatology (QIDS) questionnaire which the Imperial team use to document the lasting reductions in depressive symptoms which psilocybin-assisted therapy can bring about in clinical studies is also given to Synthesis participants. It is important to note that everybody is affected by depression, to some degree. Everybody who takes the QIDS test will get a depression score, regardless of whether they have (or would be given) a clinical diagnosis of depression or not. Possible QIDS results range from the lowest scoring category, of no depression, through to mild, moderate, severe, and finally, very severe depression. Unfortunately at this point in time, we can not accept anyone with a clinical diagnosis of depression, and, correspondingly, our participants’ baseline QIDS scores are usually low. Nevertheless, echoing the findings on the lasting positive effects of psilocybin from the Imperial team, the guests at Synthesis experienced a sustained reduction in depressive symptoms. At the two and four week follow-ups after their psilocybin ceremony, their QIDS scores remained significantly lowered, compared to their scores before attending the retreat. Synthesis does not claim to treat depression. The fact that, in our data, our participants exhibit enduringly reduced depression scores in follow-up questionnaires, is a potential testament to the positive impact on a person’s overall wellbeing that attending a psilocybin ceremony at Synthesis can have. However, these results should not be interpreted as a suggestion that attending a Synthesis retreat can serve as a treatment for depression. If you are keen to experience psychotherapy with psilocybin as a treatment for depression in a safe, legal setting, you can apply to take part in a clinical trial. According to their responses to the Connectedness Scale, the degree of connection that each participant experienced to themselves, others, and the wider world, more than doubled at two weeks after psilocybin, increasing by 131.6% on average. At the four week follow-up, it remained more than doubled, at an increase of 118%. 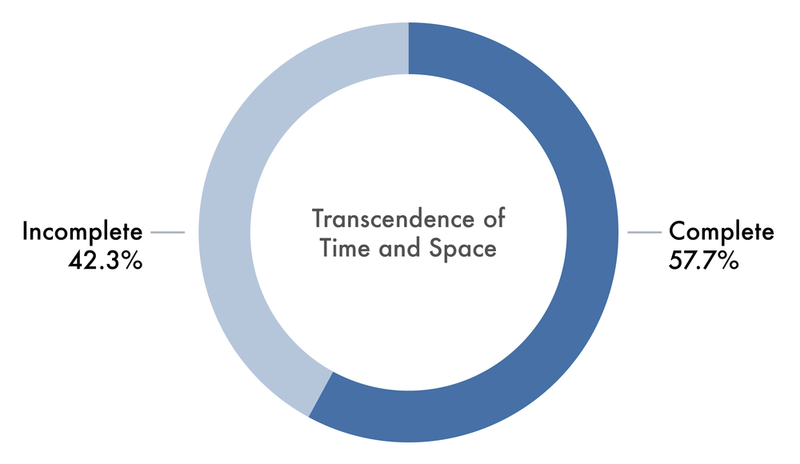 Data were analyzed using a repeated measures ANOVA with a within-subjects factor of Time after the ceremony measuring subsequent effects on connection with oneself, others, and the wider world at baseline, two weeks and four weeks. Mauchly’s test indicated that the assumption of sphericity had been violated (χ2(2) = 13.126, p = 0.001), therefore degrees of freedom were corrected using Greenhouse-Geisser estimates of sphericity (ε = 0.722). The main effect of Time was significant [F (1.44, 40.43) = 141.145, p < .001, η2 = 0.834] so post-hoc paired t-tests were used. The degree of connection with oneself, others, and the wider world increased significantly [t(41) = 17.071, p = < 0.001] between baseline (M = 32.22, SD = 13.26), and two weeks after psilocybin (M = 74.63, SD = 15.4). This increase remained significant at the four week follow-up, [t(31) = 12.182, p = < 0.001] as participants’ scores continued to show more than double the level of baseline connectivity (M = 70.25, SD = 17.37). According to their results in the Spielberger State-Trait Anxiety Indicator (STAI), the degree of fear and stress reported by participants decreased by 15.9% two weeks after psilocybin and remained lowered by 13.8% at the four week follow up. Data were analyzed using a repeated measures ANOVA with a within-subjects factor of Time after the ceremony measuring subsequent effects on fear and anxiety at baseline, two weeks and four weeks. Mauchly’s test indicated that the assumption of sphericity had not been violated (χ2(2) = 2.201, p = 0.33). The main effect of Time was significant [F (2, 56) = 4.552, p = 0.015, η2 = 0.140] so post-hoc paired t-tests were used. The degree of fear and stress decreased significantly [t(41) = -3.719, p = 0.001] between the average baseline score (M = 41.98, SD = 13.83) and two weeks after psilocybin (M = 35.32, SD = 12.43). This change remained significant [t(31) = -2.731, p = 0.01] at the four week follow-up (M = 36.15, SD = 13.68). Within the five subscales of the Ten-Item Personality Indicator (TIPI) assessment – openness, agreeableness, conscientiousness, extraversion, and emotional stability – we saw significant increases in agreeableness and emotional stability. We didn’t find an increase in openness, which other studies have shown in the past. This seems to be due to a ceiling effect, as most of our participants were already high in openness to begin with. Agreeableness after four weeks (M = 5.56, SD = 0.91) was significantly higher [t(31) = -3.007, p = 0.005] than baseline (M = 5.01, SD = 1.19). Similarly, emotional stability after four weeks (M = 5.11, SD = 1.34) was significantly higher [t(31) = -2.214, p = 0.034] than baseline (M = 4.72, SD = 1.59). 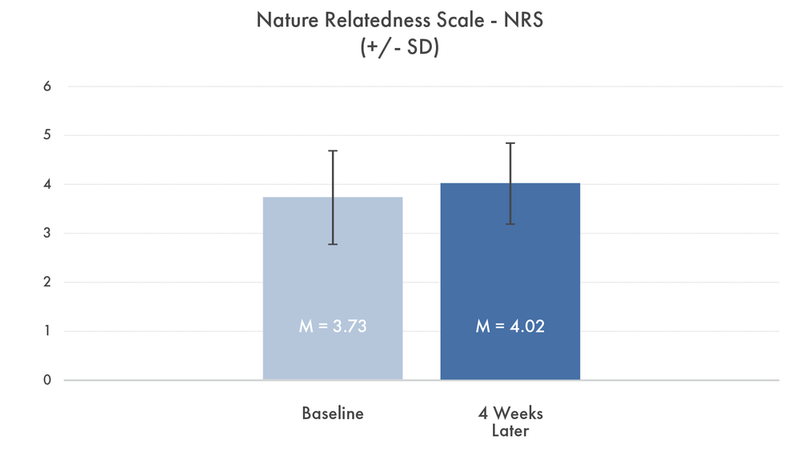 The connection with nature which participants felt, measured by the Nature Relatedness Scale (NRS), increased by 7.7% from baseline, four weeks after psilocybin. The degree of connection with nature rose significantly [t(31) = 2.537, p = 0.016) between baseline (M = 3.73, SD = 0.96) and four weeks after psilocybin (M = 4.02, SD = 0.83). Overall, participants going to a Synthesis retreat felt, on average, very well prepared (M = 84.9, SD = 17.9), ready to surrender to the experience (M = 89.33, SD = 13.1) and had clear intentions (M = 81.43, SD = 17.66). Anxious feelings were present in some participants (M= 33.77, SD = 29.32), but the overall good mood was high regardless (M = 86.41, SD = 14.88). Regarding their relationship to the physical and social setting, the environment felt good (M = 93.12, SD = 8.89) and people felt that they had a good relationship to facilitators (M = 90.53, SD = 12.58). Participants were also asked about the different kinds of insights they gained during the experience. On average, participants gained the greatest level of insight into new ways of thinking about themselves and their problems (M = 69.36, SD = 33.15), closely followed by insights on how they would like to change things (M = 67.33, SD = 32.51). Participants also fairly commonly became more conscious of aspects of themselves that they used to ignore (M = 67.12, SD = 30.3). This increased level of awareness also extended to becoming conscious of aspects of the past (M = 56.45, SD = 37.20) and aspects of their lifestyle (M = 56.12, SD = 36.31) that used to be ignored. Finally, participants also indicated that they had gained new insights regarding the influence of past events on their lives (M = 54.69, SD = 33.15). Although the questionnaire comprised a wider variety of topics, we’ve decided to highlight those which we believe provide the most insight into the social experience of attending Synthesis. Overall, the majority of participants felt a sense of harmony with the other participants (Moderately agree: 12.1%, Agree: 45.4% and Strongly agree: 30.3%), while a small number neither agreed nor disagreed (9.1%) and even fewer that disagreed (Moderately disagree: 3%). Participants also felt strongly that their time at the Synthesis retreat allowed them to get to know the others (Moderately agree: 25%, Agree: 34.4% and Strongly agree: 34.4%), while very few could not decide (3%) and a similar number disagreed slightly (Moderately disagree: 3%). Regarding initial perceptions on one another’s social standings, this dynamic seemed to dissipate for most participants (Moderately agree: 6.1%, Agree: 33.3% and Strongly agree: 51.5%). The positive results found regarding social factors also led to more intimate, open and honest disclosure (Moderately agree: 24%, Agree: 48% and Strongly Agree: 21%). While no participants disagreed with this statement, some could not determine whether they agreed or disagreed (6%). Due to the positive environment, which is conducive to intimate sharing, it is important to be aware of the risk that people may share more during the retreat than they retrospectively feel comfortable with having disclosed. Although the large majority did not feel this way (Moderately disagree: 24%, Disagree: 45% and Strongly Disagree: 9%), some did attest to having had this experience (Moderately agree: 15%, Agree: 3%), while a small number couldn’t say (3%). Although this is a preliminary study on a moderate group of retreat participants, and the size and significance of the effects is not yet certain, our results mirror those found in large-scale studies of psilocybin. Research has shown that psilocybin reduces depression scores, increases the chance of mystical experiences, reduces anxiety, and amplifies a person’s openness and connection with nature. Using the same questionnaires that feature in this clinical research, our data, similarly, shows a trend for the psilocybin experience at Synthesis to potentially increase wellbeing, reduce depressive symptoms, increase connectedness and nature-relatedness, reduce anxiety, and induce a mystical experience. We are one of the first psilocybin retreats to compile data from our participants, and the first to collect data for a scientific project by the research group at Imperial College, London. We are excited about continuing this contribution, which is hoped to improve the standard of psychedelic research and make participation in psychedelic retreats even more safe and beneficial. The main shortcoming of our study is the number of participants involved. Over the coming months at Synthesis, we plan to recruit more of our guests to this study and improve the robustness of our findings. Additionally, all data is based on self-report measures, which increases the probability of answers being biased, due to social desirability and advocacy for psychedelics. Furthermore, participants who did not benefit from their Synthesis experience would also be more likely to drop out of the survey. As we add more people to the study, we anticipate that the effect sizes seen will grow. We will also begin to apply more in-depth statistical analyses to this preliminary analysis, to account for and help preclude potential statistical errors. The very encouraging pilot results presented here demonstrate that there is a significant value to undergoing a guided psychedelic experience, such as what we offer at Synthesis, in terms of the lasting benefits to wellbeing that it has the potential to provide. In the future, we hope to diversify the types of data we collect, so as to improve our understanding of how environmental and psychosocial elements contribute to participants’ overall experience of the retreat. More widely, we are keen to investigate the dynamics of psychedelic group experiences, so as to contribute to the devising of harm-reduction practices for use at retreats. Specifically, our initial feedback has evidenced the dichotomy between appropriately challenging psychedelic experiences, versus those which the voyager feels ill-equipped to navigate. We are keen to investigate this further, and explore the possibilities of manipulating the set, setting and guidance techniques so as to reliably siphon participants’ experiences away from a negative sphere and into a psychologically beneficial one. 1↑ All data was captured voluntarily. We support Open Science, a movement to make all scientific research and and its dissemination universally accessible. 3↑Haijen, E. C. H. M., Kaelen, M., Roseman, L., Timmermann, C., Russ, S., Nutt, D., ... & Carhart-Harris, R. L. (2018). Predicting responses to psychedelics: a prospective study. Frontiers in pharmacology, 9, 897.